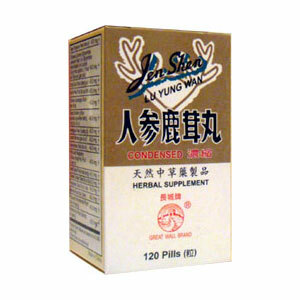 Jen Shen Lu Yung Wan supports the general health and well being of the body. Helps maintain physical strength, a healthy locomotor system, and healthy kidneys. Great Wall Brand – Tianjin Zhongxin Phar. Group Corp., Ltd. Supplement Qi, strengthen Yang, nourish blood, promote congenital Jing. Fatigue, weariness, shortness of breath, poor hearing, tinnitus, weak legs, palpitations, insomnia and long illness due to deficient Yin and deficient Yang. Cold limbs, impotence, frequent urination due to weak kidney Yang. Amenorrhea, hypomenorrhea, hypermenorrhea, leukorrhea due to deficient Qi and blood. Neurasthenia, anemia, diabetes mellitus. Keep out of reach of children. Do not take if pregnant or nursing in excess of recommended amounts, or for prolonged periods of time, or in cases of constipation and scanty, dark urine. Not recommended in cases of high blood pressure, headaches, diabetes, liver disorders, spleen deficiency, severe kidney insufficiency, frequent copious urination, difficult urination, excessive menstrual bleeding, hypokalemia, early stages of cough, or rashes, dry cough, stomach deficiency, diarrhea, lack of appetite, indigestion, nausea, vomiting, or allergies to ingredients in this product. Use with caution in cases of coughs with phlegm, bloody sputum, asthma, emphysema, or abdominal distention. Avoid prolonged exposure to sunlight and the consumption of tea or turnips when using this products. Take 5 pill, 3 times a day.